While working with Excel, we are able to lookup a value and retrieve data from a data set using the VLOOKUP function. 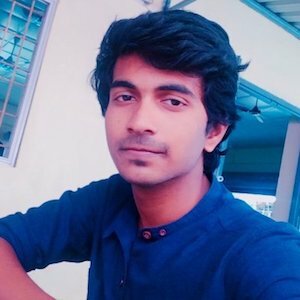 VLOOKUP provides a quick way of looking up a value from any list or range. This step by step tutorial will assist all levels of Excel users to calculate grades with VLOOKUP. 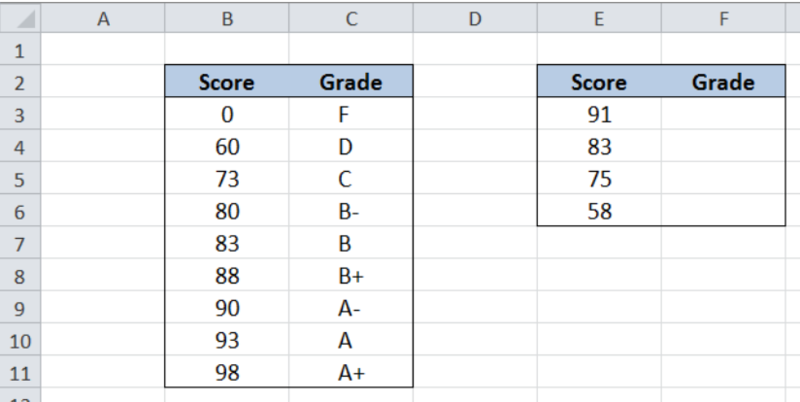 Our data consists of two columns: Score (column B) and Grade (column C). In cells E3 to E6, we enter the scores we want to look up from our data in B3:C11. 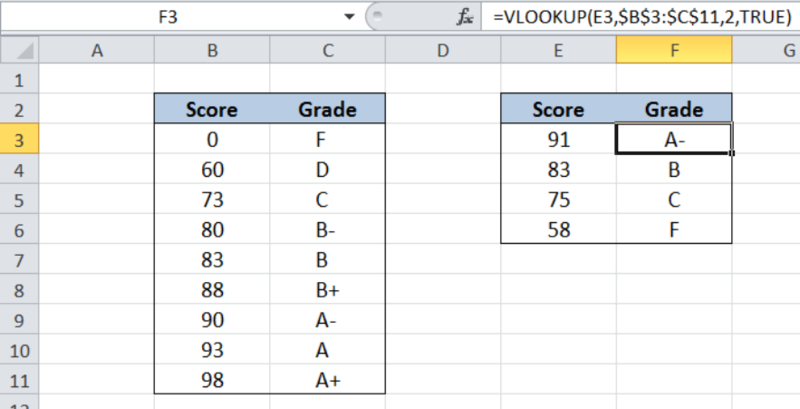 In cells F3 to F6, we want to determine the corresponding grade for each given score by using VLOOKUP with an approximate match. It is important to remember that the table must be sorted in ascending order for the VLOOKUP formula to function properly with an approximate match. Our lookup_value is cell E3, which contains the score we want to search for: “91”. Our table_array is the range B3:C11. 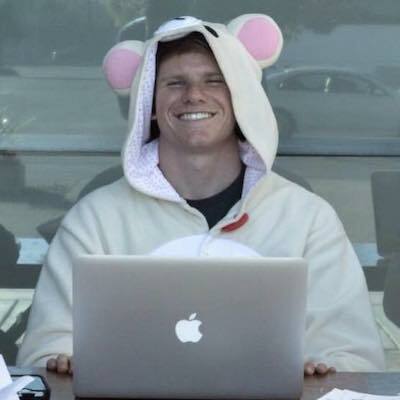 “Grade” is in the second column of the table array so col_index_num is 2. Range_lookup is TRUE because we want to find either an exact or approximate match. Our formula searches for the value 91 in the first column of our lookup table B3:C11, then returns the corresponding grade in column C. If it doesn’t find an exact match, it will return the value closest to and less than the lookup value. In our example, since 91 cannot be found in column B, our formula returns the grade for the value less than 91, which is 90. As a result, the grade in cell F3 is A-. Copying our formula to cells F4 to F6 returns the grades for the scores 86, 75 and 58. Need help with a VLOOKUP table. Boss asked me to sort grades in the table. Will input data in the session.